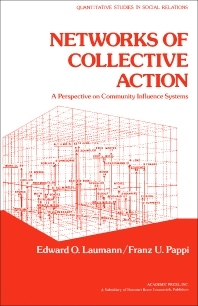 Networks of Collective Action: A Perspective on Community Influence Systems develops a theoretically informed research framework for the structural analysis of social systems. To this end, special attention is given to two fundamental issues in structural analysis: First, how does one most usefully define or identify the elementary units, be they individuals, corporate actors, or population subgroups, that comprise a given social system, and in what ways should these elementary units be characterized or differentiated from one another? And, second, what are the relational modalities by which these actors are linked to one another in ways that are relevant to understanding how their individual preferences and behavior are coordinated or integrated with one another for purposes of collective action (i.e., to achieve collective goals)? The book is organized into three main parts. Part I describes the research site and its environmental context, and then makes a structural analysis of the internal social and value differentiation of the population subsystem. Part II focuses on the elite subsystem and on its role in resolving specific community controversies. Part III turns to a topic often neglected in studying democratically legitimized influence systems: the systematic theoretical and empirical characterization of the relationships between the elite and the population subsystems in the community. Altneustadt: A Case of the Drosophila Fruit Fly?